A trampoline is an elevated, essentially buoyant webbed bed or canvas sheet supported by springs or elastic shock cords. It is surrounded by a metal frame and used as a springboard for tumbling. The trampoline is used in the sport of trampolining (sometimes called rebound tumbling). In the sport, the trampoline is used to rebound the athlete, so he or she can perform acrobatic movements in midair. The trampoline is also a training tool for gymnasts, divers, and pole vaulters. Tumbling and acrobatic moves have existed for centuries. Humans have tried to get in the air in many ways. One of the first ways was the springboard. The springboard allowed the performer to leap high with little effort and do acrobatic stunts. Another device used to get airborne was called "the leaps." It was made of a resilient, rather narrow wood plank supported at both ends by blocks that kept the plank off the floor. Court jesters in the Middle Ages jumped on it when they performed at court. Circus lore has it that a Frenchman, named du Trampoline, helped develop the basics of the trampoline as we know it. For years, circus performers had used a net under the trapeze so they could rebound. By developing a system of spring suspensions, the Frenchman, a former trapeze artist, moved trampoline development forward. He adapted safety nets and experimented with spring suspension systems to make the earliest form of the trampoline. The trampoline was not widely popular until the 1900s when circus performers made it a feature attraction. It became a modern sport in 1936 when the present-day trampoline was developed by American gymnast George Nissen. 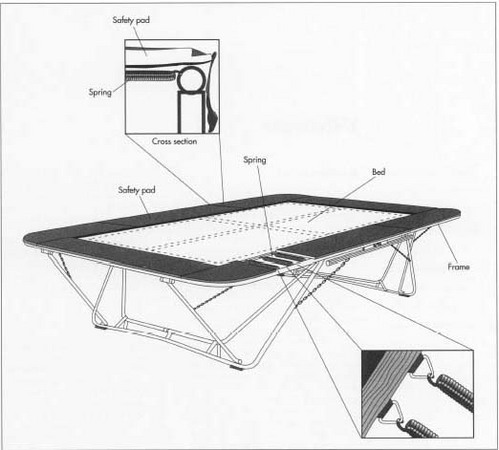 In the United States, trampoline was originally a trademark for the apparatus perfected by Nissen. Surprisingly, trampolining became popular in the United States when World War II broke out. It was used for recreation and physical education purposes in the armed forces. It was especially important for pilot and air crew training because it helped to instruct trainees in body position and sensations associated with flight. After the war, physical education teachers introduced trampolining in schools because of its physical benefits as well as its potential for fun. Its use spread to universities and places like the YMCA/YWCA as a competitive sport for students. Unofficial trampolining contests in the United States first took place in 1947, with official competitions soon following in 1954. International trampolining events began in 1964. An international governing body was formed, the International Trampoline Association, to govern the sport worldwide. In a trampoline competition, each trampolinist performs two routines, one compulsory and one optional. During each routine, the performer can only make eight contacts with the trampoline. Scoring is based on difficulty, execution, and form. The winner of the compulsory and the optional events performs another optional routine to determine an overall champion. Since the 1950s, trampolines have also been used by visual therapists and special education teachers to improve vision, balance, and coordination in their students. In 1977, however, trampolines were discarded as part of the physical education curriculum in public schools because of a negative report issued by the American Academy of Pediatrics. It said that trampolines were dangerous and could cause injuries such as broken bones and quadriplegia. Although in a 1995 Circuit Court of Appeals case, Dea Richter versus Limax International, Inc., the court decided that a trampoline manufacturer can be liable for injuries resulting from repetitive use of the apparatus, the trampoline has remained a popular source of exercise and fun at home. Today, trampolines are used for improving health through cardiovascular exercise. Using a mini-trampoline, called an aerobic rebounder, can improve stamina, strength, and coordination. Rebounders were first manufactured in 1975 and marketed as an indoor jogging aid. Trampolines are made of four basic components: the tubing, springs, jumping mat, and safety pads. The tubing, used to make the frame and legs of the trampoline, is usually made of galvanized steel and is bought at a certain length and width from a supplier. Using galvanized steel protects the frame from rust and environmental conditions as many home trampolines are for outside use. The springs, which give the trampoline its bounce, are commonly made to the specifications of the trampoline company by another supplier. Usually, the company making the springs specializes in spring manufacture. The jumping mats are made of woven fibers. Today, mats are made of artificial fibers like polyethylene or nylon. The heavily woven fabric is WV-protected to prevent fading when used out of doors. Safety pads go over the springs and frame and are made of foam. They have vinyl covers and pie straps to connect the pads to the frame. The manufacture of the foam core of the safety pads is also outsourced and made to manufacturer specifications. When the tubing arrives at the trampoline factory, it is bent into an arc on the bending jig. Holes are punched into the sides for the springs. Sockets are welded so that the U-shaped legs can fit into the frame. The tubing often comes in four pieces. When connected, all four create a circular design. One end of each arc is swaged—squeezed down—so that the pieces can be put together. Once delivered to the factory, the fabric for the jumping mat is cut to size. Using industrial sewing machines, the fabric is edged, and reinforced web strapping is sewn on. D-rings are also sewed into the fabric to hold the mat to the frame. Around the foam core of the safety pads, a vinyl cover and pie straps are sewn to increase durability. The springs do not require any additional manufacturing processes at the factory. They are packaged, along with the other parts, for final shipment. It takes about 80 people working an eight-hour shift in the trampoline factory to make 500 to 600 trampolines. The American Society for Testing and Materials has established safety and quality standards for trampolines. All materials used in trampoline manufacture are checked at regular intervals to see if they meet established guidelines. The steel frame's bend, gauge, and thickness of galvanization are inspected. Before the mat is sewn, the weaving is checked for flaws. The tension of the thread is subject to durability testing as well. The sewing on the mat is inspected after it is completed. Before the springs are packaged with the rest of the components, they are inspected for flaws. Trampolines are made of four basic components: the tubing, springs, jumping mat, and safety pads. The springs connect the jumping mat to the tubing and give the trampoline its bounce. Safety pads go over the springs and frame and are made of foam. Recently in Great Britain, the Inwood Ryan Company designed the "frameless" trampoline. It is supposed to be safer because it prevents children from hurting themselves on the metal frames. Presently, it is uncertain whether it will become a widespread innovation. Griswold, Larry and Glenn Wilson. Trampoline Tumbling Today. A.S. Barnes and Company, 1970. Hennessy, Jeff T. Trampolining. William C. Brown Company Publishers, 1968.
International Trampolining. 1996. http://www.worldsport.com/sports/trampoline/home.html (July 14, 1997). I have a question we recently had a small fireworks show in my back yard and my neighbor says some live debri burnt their trampoline. I am wondering just how that could be possible when my fireworks of course will burn for a few seconds which is normal I quess but I dont believe it burne dlong enough to do any damage. I've seen and been on many tramoplines and they are very durable and flame retardant. I'm confused...Thank-you for any answer on this..